Dates: It falls on April 15 of the Tibetan calendar. According to the legend, it was on the 15th of the fourth month when Sakyamuni was born, achieved enlightenment and attained nirvana, so various activities are held to commemorate Sakyamuni in this month each year. All the activities on the Festival constitute the large-scale activity of Zhuanjing (circumambulation). Sutra chanting, prayer-wheels turning, Cham dancing and other religious activities dominate the session. Dates: It usually falls from April 15-18 on the Tibetan calendar. There are different versions of the origin of Gyangtse Horseracing andArchery Festival. Horse racing, archery contests, and other games are performed to entertain people. Religious activities also are part of the event. 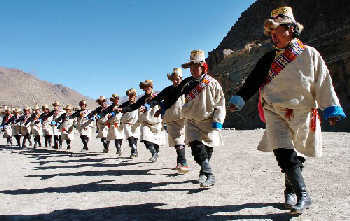 Dates: It is held on December 29 on the Tibetan calendar. The festival is also called the Sorcerers' Festival. 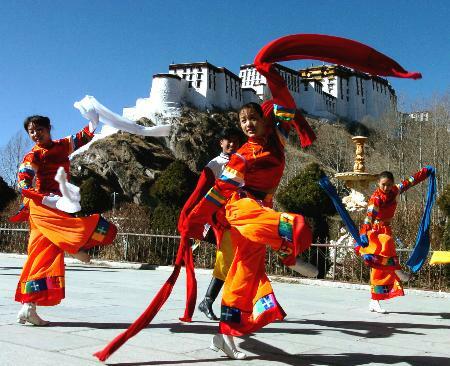 It falls on the 29th of the 12th Tibetan month, and large-scale sorcerers' dances take place at Lhasa's Potala Palace and other monasteries to subdue devils and ward off disasters. At night, in every household traditional means of driving off evil spirits are carried out, such as burning bundles of straw and throwing rubbish in the crossroads. Year's End Dumplings are served for supper. Dates: It takes place on March 6 of the Tibetan calendar. The festival is mainly celebrated to pray for rain and children. The lama patters, placing animal figures in the water. While returning, they open the rain gear and make a racket, indicating it has begun to rain. After that, they worship a round pagoda that contains a knife and a boiler symbolizing procreation. Place: A temple of Ben-Sect on Benri Mountain, which is located about 6 kilometers away from Linzhi County of Tibet. On this day, residents near the temple dress up and gather at the temple. They perform joyous dances and hold contests to welcome 100 eagles. They also pray for bumper harvests as well as prosperity for humans and livestock. At last, they tell the eagles about the temple, and then go around the temple three times in groups. It is said that if it is a fine day, the devoted disciples of the Ben Sect can see 100 hovering eagles.